Throughout the 2016 IIHF World Championships, the Russian line of Artemi Panarin, Vadim Shipachyov and Evgeni Dadonov has been among the competition’s elite. Combining for 12 goals and 34 points, members of the trio have torn up the opposition, occupying three of the tournament’s top-four positions on the scoring leaderboard. Tuesday proved no different. Responsible for five of their team’s 11 points, the scorching combo powered Russia to a 4-1 victory over Sweden at the Moscow Ice Palace. Looking to defeat the Russians in World Championship play, the Swedes got off to a strong start in the first period, maintaining possession but otherwise unable to test netminder Sergei Bobrovsky. Soon enough, Russia began to gain traction, shifting the flow of play and pressing Swedish goalie Jacob Markstrom to the tune of 18 shots against. After spinning its wheels for the better part of the frame, Russia found itself on the board with just over five minutes remaining. Fanning on a cross-ice Panarin feed, Dadonov’s change-up of a one-timer wormed its way over a spread-eagled Markstrom for the diminutive forward’s fourth goal of the tournament. Shipachyov picked up the secondary assist. Minutes later, the troika would strike once more: After a rifle of a one-timer, Panarin widened the gulf to two, giving Shipachyov his second helper of the contest. The Russian flurry continued into the second, as Pavel Datsyuk and Roman Lyubimov found twine eight minutes apart to cleave open a four-goal advantage. Eventually, Sweden found its way onto the scoreboard. Appearing in his first game of the competition, Nashville Predators blueliner Mattias Ekholm laced a slapshot from the right face-off circle past a screened Bobrovsky 1:06 into the game’s final period. 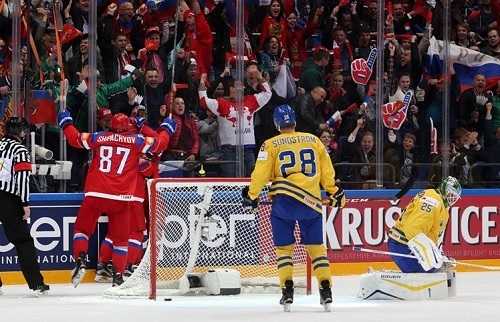 However, any illusions of a comeback were snuffed by the Russian defense: Turtling for the remainder of the contest, Russia absorbed the Swedish attack, denying the Tre Kronor on 15 of its 16 scoring attempts. Following the convincing victory, the Russians locked down their quarterfinal berth. As the second seed out of Group A, they’re slated to take on third-seeded Germany on Thursday in Moscow.